While DC Comics icons like Superman and Batman starred in a series of successful films back in the day, Marvel Comics stable of superheroes and villains were in a much more precarious place for decades. Marvel went bankrupt in the mid-90s. 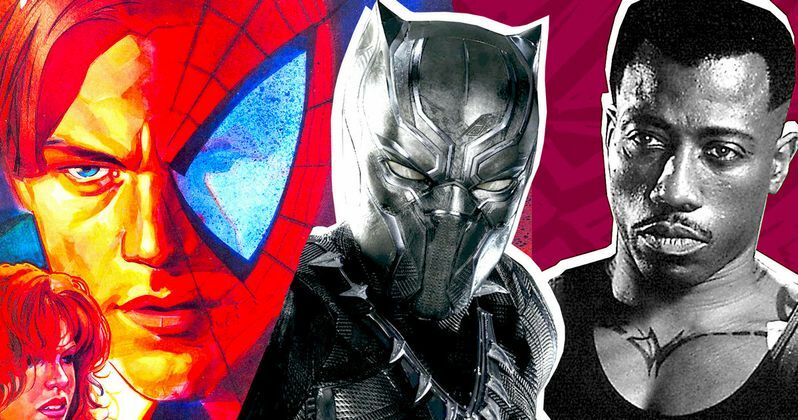 The Marvel Universe was broken apart in a myriad of licensing deals, with movie and TV rights to their biggest characters and supporting casts spread across different studios. We recently unearthed a fascinating report from Hollywood trade publication Variety, published in December 1992, which offered a look at Marvel's slate way before the blockbuster success of the Avengers, or even the X-Men. Here we'll take a look at 9 Marvel Movies We Almost Got in the '90s. Variety reported that James Cameron hoped to write, direct, and produce a Spider-Man movie with Terminator 2 studio Carolco, who'd acquired the rights from Marvel two years before for just $5 million. With a rumored production budget of $60 million, his Spidey could've been the most expensive movie ever made at the time, a distinction that would of course eventually go to another Cameron film, Titanic. Cameron's Spider-Man was rumored to star Leonardo DiCaprio, with Robyn Lively as Mary Jane Watson, R. Lee Ermey as J. Jonah Jameson, Michael Biehn as Sandman, Lance Henricksen as Electro, and Arnold Schwarzenegger as Doctor Octopus. Many years before Disney and Marvel's billion-dollar trip to Wakanda, action star Wesley Snipes worked to get a film version of The Black Panther off the ground, with none other than Stan Lee's blessing. There were different writers and directors considered during the process, including Mario van Peebles and John Singleton. As Snipes revealed to the Hollywood Reporter in a fantastic 2018 article, the stars just didn't align back then, especially considering the state of special effects. Snipes of course ended up playing another iconic black superhero for Marvel, in 1998's Blade. The vampire hunting vampire badass who debuted in Tomb of Dracula in the early 70s had a long journey to the big-screen, with David Fincher involved at one point. In Variety's 1992 Marvel movie round-up, the trade publication reported that rapper LL Cool J was "developing 'Blade,' the story of a black vampire hunter.'" Debuting in August 1986, Elektra: Assassin was one of the best-limited series in the history of comics, written by The Dark Knight Returns scribe Frank Miller and drawn by Bill Sienkiewicz, the visionary known for Moon Knight and New Mutants. Now imagine another visionary in the mix: Oliver Stone. In early 1992, the director was in early discussions to adapt the limited series, confirmed by Variety and later, in the press notes for Natural Born Killers. Stone's film would have pitted Elektra against The Hand, as the rights to Nick Fury and SHIELD were elsewhere. Eventually Elektra was sold off to Fox with Daredevil. Jennifer Garner played the ninja assassin in the studio's Daredevil and its spinoff, Elektra. In recent years, Elodie Yung made for a fantastic Elektra in Daredevil Season 2 and Marvel's The Defenders, both on Netflix. Speaking of Marvel's The Defenders on Netflix, long before the Luke Cage TV series, The Crow producer Edward R. Pressman was developing a live-action film titled simply Cage. He commissioned a script from screenwriter L.M. Kit Carson, who'd co-written Paris, Texas with Sam Shepard and The Texas Chainsaw Massacre 2. The 1992 Variety article also mentioned the Fantastic Four, the rights to which had been sold off in 1986, resulting in the much-maligned Roger Corman produced 1994 film, an unreleased disaster many believe was made simply to hold onto the rights. Of course we didn't get a big-budget movie until Fox's 2005 film, which was followed by a middling sequel, then a poorly received reboot in 2015. Speaking of the Hulk, Arad was developing that with producer Gale Ann Hurd as far back as 1990, when the last TV movie starring Bill Bixby was finished. Hulk was setup at Universal in 1992, with Hurd's husband Jonathan Hensleigh involved. A number of writers and directors were involved in getting the green goliath to the screen, including Hensleigh, Joe Jonnston, Zak Penn, and J.J. Abrams. By 1998, the studio had spent $20 million on script development, computer animation, and prosthetics, with versions including villains like The Leader and Absorbing Man. Like Ghost Rider, a Hulk film wouldn't actually get made until the new Millennium.